There's one design element that's an instant selling point for us, whether it's on a dress, a skirt, or a pair of workout leggings. Any guesses? We're talking about pockets—something that seems so minuscule but actually makes all the difference by providing easily accessible storage for the day-to-day necessities we reach for more often than we like to admit (chiefly our phones). Frankly, there's no better feeling than discovering that the cute, flowy skirt you're debating purchasing is as functional as it is stylish. And the same can be said about a pair of leggings. With added compartments, the comfortable, breathable workout pants become all the more practical, providing a concealed place to store the essentials we typically bring to the gym. 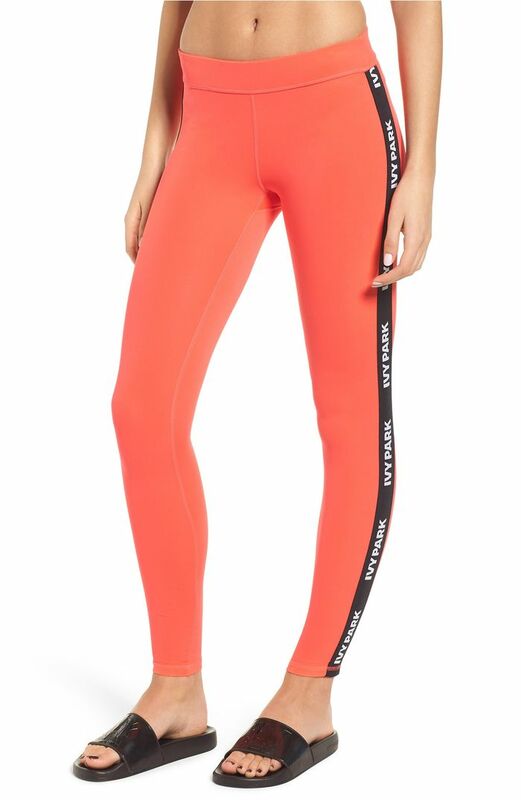 Upon first glance, however, most of the leggings that have been designed with added compartments don't appear as such (because the pockets are placed either in the back or within the waistband), so when shopping for the workout pants online, it's important to read the product description. Which is exactly what we did to uncover the best leggings with pockets. Our findings? Some of our go-to retailers, including Nordstrom, Amazon, Target, and Shopbop carry a wide range of trendy, moisture-wicking, über-functional options you can wear in and out of the gym. Ready to see our picks? Read on to shop leggings that are as trendy as they are functional. A hidden waistband pocket keeps your valuables safe and secure while working out. Available in sizes XXS to XL. Classic black leggings are a must-have in everyone's workout rotation. Available in sizes 00 to 24W. We're loving the moto-inspired panels on this pair. Available in sizes M to L.
A classic pair you can easily wear at the gym and out for errands (or brunch with friends). This pair has five (yes, five) easy-access pockets. We're loving floral leggings for fall. Colorblock leggings are so trendy. This pair has big side pockets perfect for storing your phone. Available in sizes XS to XXL. This is a top-rated pair on Amazon—and we can see why. They're stretchy and moisture-wicking, and they have a practical pocket. Available in sizes S to XL. These are perfect for everyday wear as well. Another perfect pair for holding your iPhone. Mesh detailing ups the cool factor of these classic black leggings. Another Amazon best seller. How cool is the design on these? A pretty soft pastel hue. Mesh panels add an eye-catching element to sleek black leggings. Try a pair in a bold hue—a major legging trend for fall. These look like pants, but they're actually leggings. Zip pockets keep all your valuables safe and secure. Check out that cool zipper detailing on the waistline. What's not to like about these? This season, test out the white legging trend with this non-transparent pair. You'll want to wear these nonstop. Make a statement with this colorful pair. Available in sizes 2X to 4X. Mesh panels and side pockets? Sold on these. High-waisted leggings pair perfectly with a cool sports bra. Shine at the gym with these shiny leggings. Want to know about more legging trends for fall? Read on to learn about the best styles to wear this fall, from the experts.